How do I get notified when there is a comment on a note? 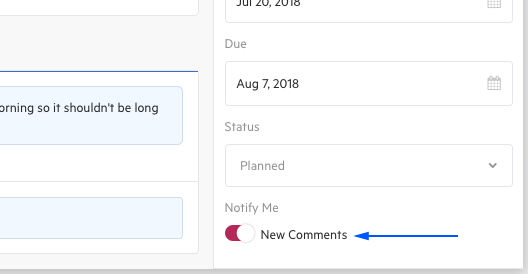 If you are part of a comment conversation on a note, you'll be notified in your Triage. If you created the note you will be notified in Triage whenever there is a new comment. If you are @mentioned in a note or a comment on that note, you will receive a Triage notification for the @mention, and then any future replies to that note. If you write a comment on a note you will be notified in Triage for any future replies on that note. If you don't wish to be notified of any future activity relating to that note, you can choose to opt out of notifications from the toggle in the note's right-hand panel. You can also use this toggle to opt in to notifications if you aren'r already a participant.